The controversial Boston Free Speech rally started at noon on Boston Common and lasted for less than an hour. Meanwhile, thousands of counterdemonstrators marched from Roxbury to the Common, where crowds had gathered to protest the rally. After violence at a rally that drew white supremacists in Charlottesville, Va., last weekend, local authorities fear similar extremists could attend Saturday’s rally on the Common. Boston Mayor Martin J. Walsh, however, has dismissed reports that Ku Klux Klan members would be attending the rally. Here is the schedule and location of each demonstration in Boston today. Organizers of the free speech rally have said the event is open to all political views and not a forum for hate groups. The permit issued for the rally was for five hours — three of which were reserved for setting up and shutting down. Where on the Common was the rally? Officials were anticipating the “free speech” rally to be small, but counterprotest organizers were expecting between 20,000 to 30,000 participants. Some of the counterprotesters met in front of the Reggie Lewis Track and Athletic Center in Roxbury at 10 a.m. and then marched down Tremont Street to the Common, according to organizers. Violence In Boston, Black Lives Matter Cambridge, and Black Lives Matter Boston were among the organizations coordinating that counterdemonstration. Another counterprotest took place starting at 11 a.m. at the State House. The Coalition to Organize and Mobilize Boston Against Trump, the Boston Democratic Socialists of America, ANSWER Coalition Boston, and the Boston Party for Socialism and Liberation were behind that protest. Barriers separated the rally attendees and the counterprotesters on the Common. What was the police presence be like? 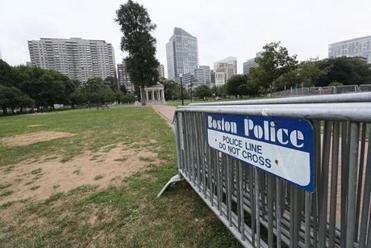 More than 500 police officers monitored the rally on the Common. Items that can be used as weapons, such as sticks and bats, were not be permitted at the rally, police have said. Guns, knives, shields, fireworks, glass containers, cans, alcohol, coolers, wagons, or pull carts, coolers, drones, grills, bicycles, pets with the exception of service animals, and pop-up tents and canopies were also prohibited. Backpacks and bags were discouraged and subject to searches. Boston officials were warning drivers to expect delays in parts of the city between 9 and 11 a.m.
Several streets will be closed at various times Saturday because of the demonstrations. Tremont Street, from Malcolm X Boulevard to Charles Street, will be closed for part of the day, as will Charles Street South and Charles Street near the Common, and other side streets that approach Tremont. Parking bans will be in effect for parts of the city, including pockets of Roxbury and areas near the Common. Cars will be towed starting at 6 a.m. For the full list of streets affected by the parking bans, click here. The MBTA will run on a normal schedule, but Park Street and Boylston stations will be closed during the rallies and reopen once the crowds have dispersed. Would you take children to protest Saturday’s ‘free speech’ rally? Who is the Boston Free Speech Coalition behind Saturday’s rally?